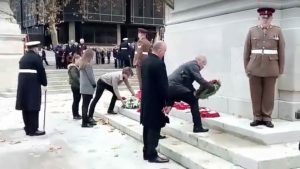 Several moving events have taken place during November to mark the centenary of the end of World War 1. ALNS fell silent at 11am on Friday 9th November to mark 100 years since the end of World War One. Every single student did this with pride and respect for all the fallen heroes. Mrs Easson, Mrs Lucas and Mrs Holness lead the tribute assemblies earlier in the week to all year groups to remind us all what remembrance means and why this year in particular is so important. 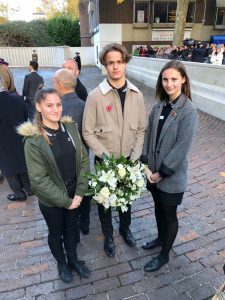 On Sunday 11th November Mrs Easson and Ms Barnes accompanied Alfie, Hannah and Erin in Year 11 to the Portsmouth Remembrance Service. 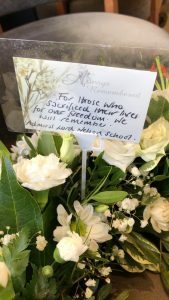 The students laid a wreath at the Guildhall on behalf of ALNS. In addition to these wonderful events, ALNS is extremely proud of the stunning art installation that can be seen in our Mall. 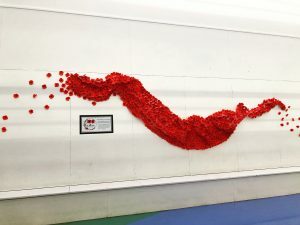 Hundreds of poppies with personal messages on from our students have been combined to create an ALNS tribute. The art work called ‘ Remembering our heroes’ developed initially by the History department and realised by our talented design technicians stands proud and is a reminder of the sacrifices in war 100 years ago and in wars since.